With an influx of modular data centers it may leave many wondering if traditional legacy data centers are a thing of the past. Traditional data centers are likely not going away completely but there are certain applications in which modular data centers are a more ideal fit. When designing a data center there are many “future proof” considerations that must be factored in to the design process so that a data center does not become unusable or outgrown. But, these same considerations often lead to traditional data centers being inefficient. Because of this, a decision has to be made as to what is best – a traditional data center or a modular data center. In the design process of a traditional data center there is often added room and extra heating and cooling capacity to accommodate growth and future needs. This methodology can help a traditional data center adapt and grow but it can also lead to an inefficient use of space and higher energy bills. Within a traditional data center energy efficiency can be achieved by taking advantage of strategies like hot/cold aisles, ceiling ducted air containment and more. When these strategies are used, a traditional data center can be efficient while still having room to grow and serving the existing needs of the data center. The problem with traditional data centers is that, often, future growth is incorrectly anticipated and if growth occurs more rapidly than expected, a traditional data center can be quickly outgrown. Modular data centers present a number of benefits, particularly for new data center builds. When starting from scratch, modular data centers allow you to start with current needs and can then be scaled up or down as future needs arise. Data Center Knowledge discusses the importance of scalability when designing a data center, “With a repeatable, standardized design, it is easy to match demand and scale infrastructure quickly. The only limitations on scale for a modular data center are the supporting infrastructure at the data center site and available land. Another characteristic of scalability is the flexibility it grants by having modules that can be easily replaced when obsolete or if updated technology is needed. This means organizations can forecast technological changes very few months in advance. So, a cloud data center solution doesn’t have to take years to plan out.” For businesses that do not have the space or budget for a full-blown data center a modular data center is an ideal solution. Modular data centers streamline the process and make it easy to quickly and efficiently get a data center up and running. They often work with minimal space but maximum efficiency to quickly and easily launch a data center. When determining whether to design a traditional data center or a modular data center space, budget, rack density and more must be considered. 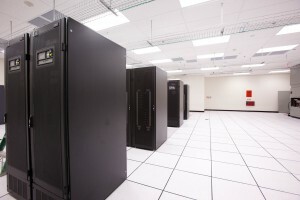 Discuss these things with a data center contractor to determine whether a traditional data center or a modular data center is the best fit for your unique needs. This entry was posted in Data Center Build, Data Center Construction, Data Center Design, Datacenter Design and tagged Data Center, data center build, Data Center Construction, data center design, Phoenix Data Center Construction. Bookmark the permalink.